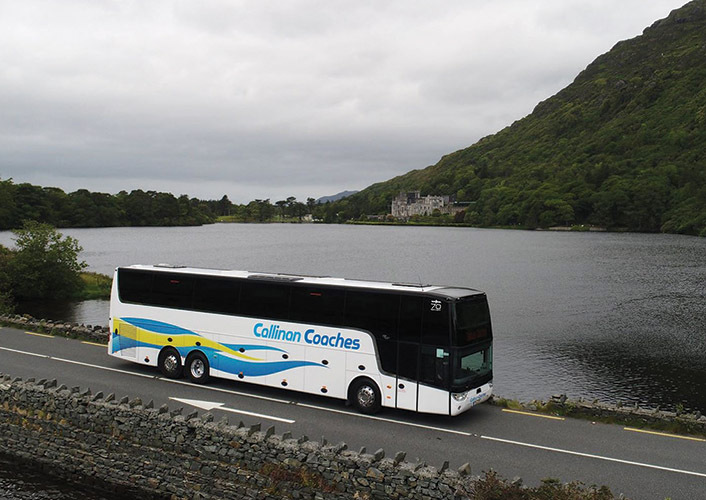 Without doubt one of the most stunning bus and coach fleets on Irish roads is that of Callinan Coaches, a Galway based Luxury Coach Service provider established in 1995. As the company marks its 23rd anniversary providing professional, high-quality coach services, we travelled to their head depot in Galway to catch up with its owner, Tommy Callinan. To provide a wide range of top-class coaching solutions both nationally and internationally, on a scale such as that offered by Callinan Coaches, regular investment in a fresh, modern fleet is a prerequisite. To this end, the addition of seven brand-new vehicles so far this year underlines their firm commitment to maintaining the highest-possible service levels across all routes and all services provided. Callinan Coaches is a fully-licensed national and international coach service operator providing a wide range of luxury solutions, including scheduled services, guided tours, transfers and corporate travel. In early June 2018, two Iveco Turas 25-seater mini coaches were acquired along with five new Van Hool TX16s to date this year. These purchases are part of the company’s proactive fleet replenishment / expansion programme, which results in the provision of outstanding, customer-friendly coaching services. Callinan Coaches have a strong presence island-wide and can also be spotted across the UK on touring duty. One of its top touring customers is CIE Tours International, to whom it provides touring services across Britain and Ireland. They demand a high quality fleet together with professional, friendly staff, which is provided consistently by Tommy’s organisation. Under the CIE International umbrella, they undertake a series of seven-, nine-, eleven-, fourteen- and all the way up to 21- day national and international escorted coach tours across Ireland, England, Scotland and Wales during the touring season. These tours have been running for the last 85 years, so Callinan Coaches are proud to be part of the CIE International team. With six Van Hool Altano double deckers with 68 seats plus one wheelchair space, as well as 48 TX16 Alicron single deckers, they’re constantly updating the fleet – a combination of replacing the older models and also bringing in new ones as they take on new business. Scheduled Citylink services account for a large percentage of daily activities. 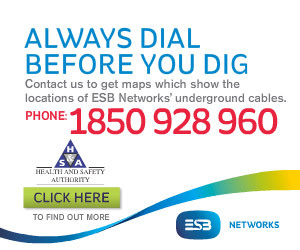 The routes covered are Galway–Dublin Airport, Limerick–Dublin Airport, Galway–Cork Airport and Galway-Clifden. As well as direct express services to and from Dublin city centre and Dublin Airport, a commuter service is also provided, stopping off at the various towns along the way. Citylink / Eireagle provide ten daily return services between Limerick and Dublin Airport. There are eight return commuter services between Galway and Dublin Airport every day, with up to 23 return journeys daily between Galway city and Dublin Airport and 25 on a Sunday. A Citylink express journey from Galway to the airport takes just three hours, while the Eireagle express can get passengers to their airport terminal in just two hours and 30 minutes! There’s also an Aircoach service between Cork Airport and Dublin Airport. Direct employment is generated for a team of 160 people, between full time and part time staff members. This includes five full-time mechanics, who ensure that the hard-working, state-of-the-art, immaculate fleet of modern, five-star vehicles, which offer passengers the ultimate in comfort (Wi-Fi, USB ports, air conditioning, reclining seats, DVD players, toilets etc. ), is running in optimal condition at all times. Their workshop is open 24/7, 364 days a year, and they also operate their own breakdown vehicles. But it’s all about preventative maintenance and their daily walk-around checks, fortnightly inspections and regular servicing ensure that the vehicles are always in great condition. Each of the coaches come in for a full service once a month. Callinan Coaches also provide coach services for Bus Eireann internationally on the Dublin to London, and Dublin to Leeds Eurolines services. Meanwhile, they also provide a cover service to Bus Eireann on an ad hoc basis to fulfil any regional service, at short notice. The key driver behind the enduring success and evolution of Callinan Coaches is the company’s founder and proprietor, Tommy Callinan. Tommy loves coaches and the coach industry and he doesn’t mind working seven days a week. He is the driving force behind the business and his enthusiasm is passed down to the staff. The employees also make a massive contribution. They are all genuinely passionate about it and, with it being a family business with a number of family members involved, it’s a very tight team and everybody pulls together in the same direction. Callinan Coaches have also built up strong relationships with their suppliers who provide a great service, which is vital to keep the whole operation running smoothly. Without their backup and flexibility, they would not be able to provide the wide range of flexible services that can be changed at short notice. Everybody knows Tommy, and likes and respects him. He has great patience and goes out of his way to look after people. This is his passion … he has looked after his customers for 23 years and has built up a lot of goodwill for that. The quality of the services provided by Callinan Coaches was recognised at the 2018 Fleet, Bus & Coach Awards, where they were finalists in both the Airport Services and Inner City Services categories. The previous time these showcase awards were staged, in 2016, they collected the Coach Operator of the Year Award for Airport Services. They were also Category winners in 2012, 2010 and 2008 Coach of the Year awards, so it has a history of recognition of its high standards. “Callinan Coaches has a bright future ahead, and aims to expand its services and grow its fleet. Here’s to the future,” states Tommy as we conclude our interview.